Imagine if you had an invisible robot running around the internet doing all kinds of tasks for you. Bots live on Twitter, on Wall Street and in factories. They cut down on pesky repetitive tasks and do things that would take humans much more time and energy. Bots started out as weak, experimental and expensive, but the rise of SaaS and automation means that you can have your very own family of bots, living exactly where you work: Slack. 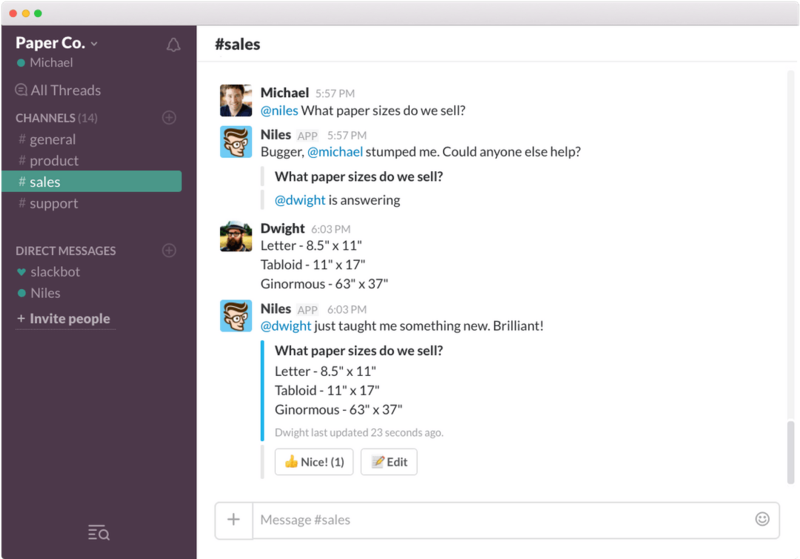 Slack is simple, text-based, searchable and allows you to customize it in creative ways. 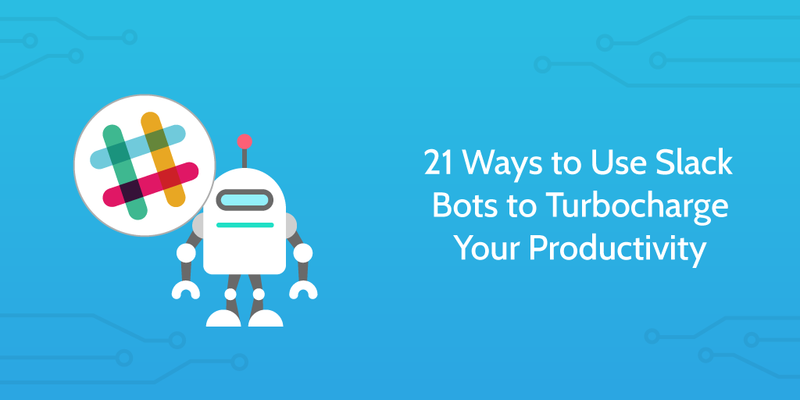 It’s the perfect environment for simple bots that can replace the need for time-consuming or interrupting tasks, and its Slack App directory makes it easy to find and plug a bot right into Slack ready to use. But, before we get into all of the cool stuff Slack bots can do, let’s get the basics down first and talk about the original: Slackbot! 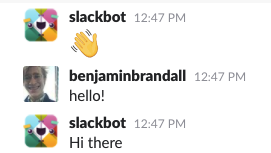 Most Slack users know Slackbot as the friendly and helpful character that helps them set up their profile. It sits in always-on mode in your direct messages, occasionally popping up to give you notifications. It’s easy to forget, but you’re missing out on a lot of great features if you overlook it. 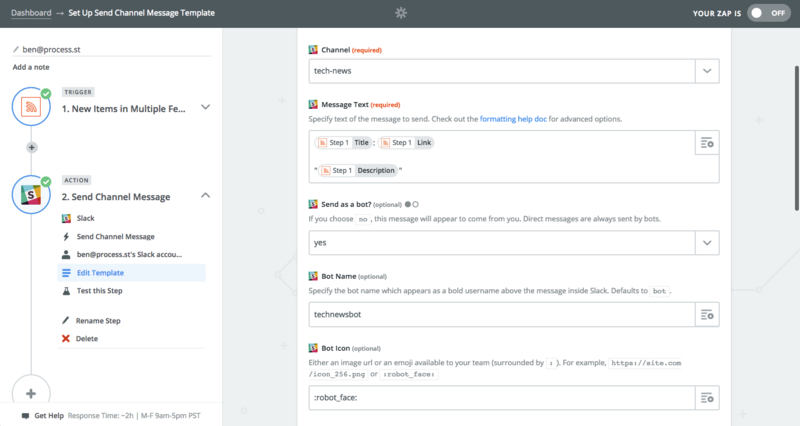 Slackbot is a highly customizable tool when you start to get into the advanced features, but you should start by learning the absolute basics. I’m sure you’ve already had some interaction with Slackbot when you first signed up, but here’s a refresher. 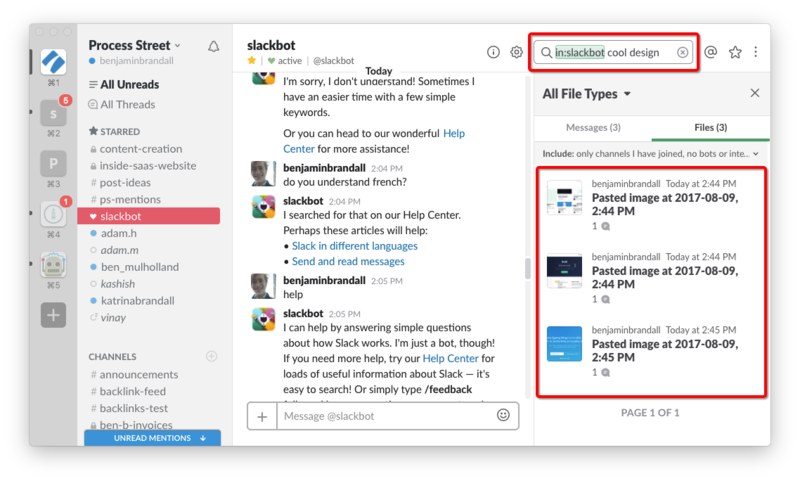 Slackbot is Slack’s built-in self service support system. 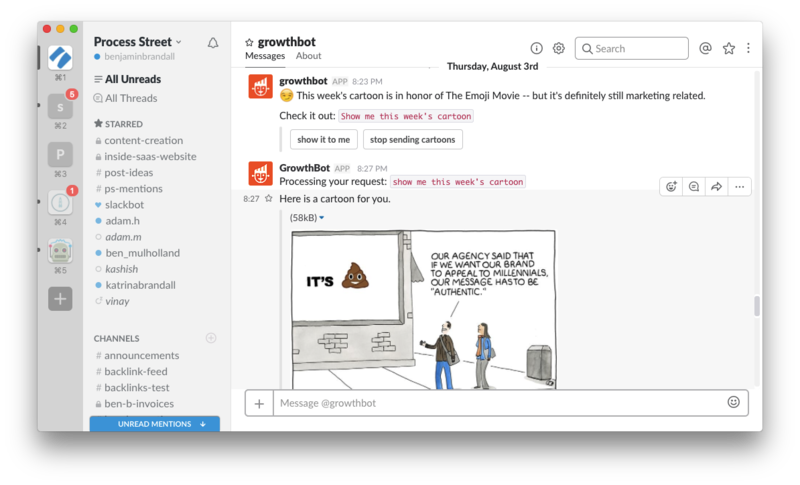 You can ask Slackbot questions, and get explanations along with links to the relevant knowledge base articles. 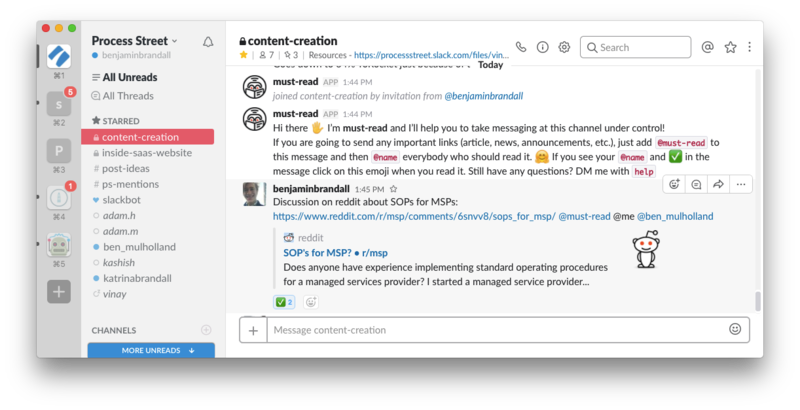 While Slack has since given you the power to message yourself, Slackbot is a great place to store information and links so that they’re indexed in Slack’s search. The search is private to you, so you can even come up with your own tagging system and be sure that no one else is cluttering it up. You don’t really have to come up with tags, either. Slack’s search is excellent, and I’ve found that I’m able to easily find anything I need. The /remind command is one of Slackbot’s most useful features. You can use it to remind yourself to do a task, to read an article or to build some kind of dark matter generator. Slackbot is also able to send someone else a reminder, and even set reminders to recur. With the list, you can snooze reminders or mark them as complete with a single click. You can use natural language to set reminders, so don’t be afraid to say things like ‘tomorrow’ or ‘next weekend’. Do, however, be careful about how complex you get. I asked Slackbot to remind me on the 1st and 15th of every month. The command confused it, and I ended up with a recurring reminder only for the 1st of every month. To set reminders without using slash commands, just hover over a message you want to remind yourself about, and click the three dots. It’s as simple as that. In three hours, I’ll be surprise-reminded about this useful lamb gif! To report for the meeting, Drew would just reply to the reminder and let everyone know the status. With this method, you can’t really store data or track the meeting notes, but it is a super fast and free solution. You can also program Slackbot with answers to frequently asked questions, or to trigger gif mayhem when it detects a certain word. Click the arrow next to your organization name, and you’ll get a drop-down menu with Customize Slack as an option. Click Customize Slack. 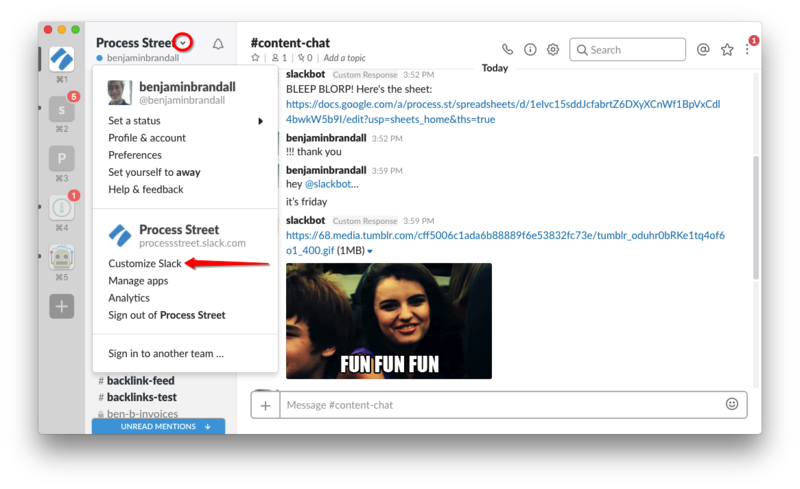 You’ll be taken to your browser, and see an option for Slackbot. Add your trigger words into the ‘When someone says’ box, and put the response in ‘Slackbot responds’. You can add multiple input phrases by separating them with commas, like affiliate links sheet, affiliate link sheet, affiliate links spreadsheet. Add multiple responses by putting each alternate response on a new line — Slackbot will say one at random! 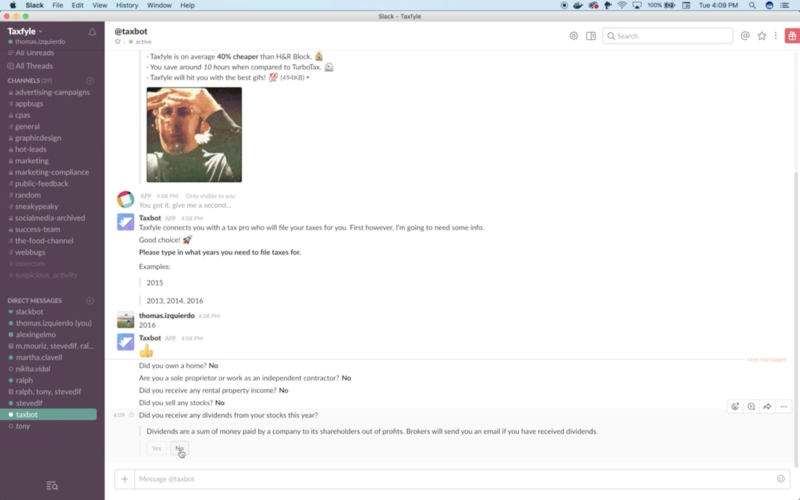 On its own, Slackbot is a great tool for reminders, Slack support and custom responses. 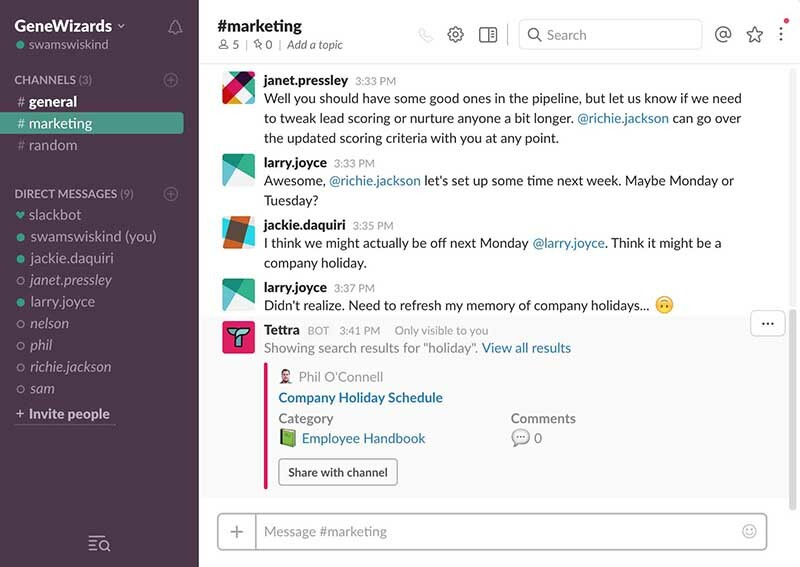 But with integrations, Slack is so powerful I couldn’t believe it when I first saw. 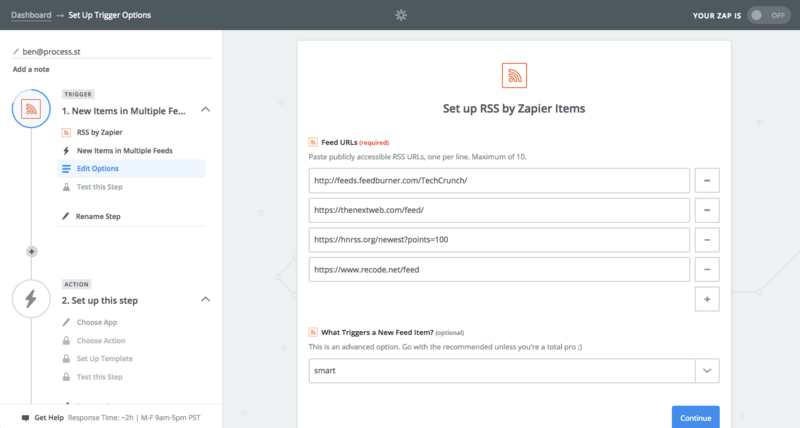 For example, you could make a quick bot (code-free) with Zapier that updates a channel every time your favorite news sites publish a story, or plug in an app from the app directory to quickly add a new slash command that lets you manage your to-do list! 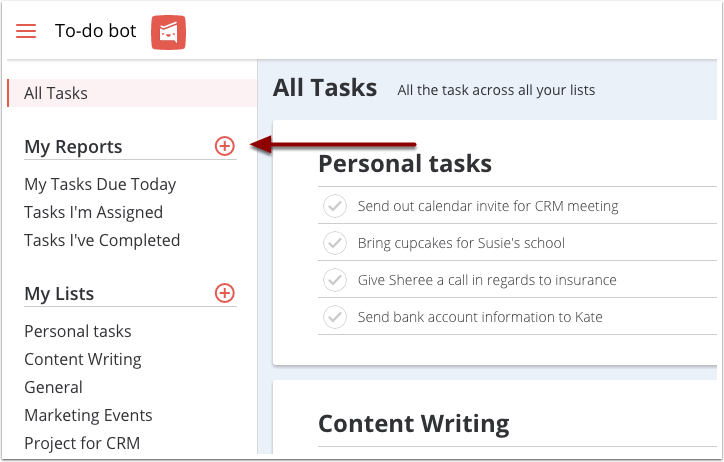 Reminders are fine, but they lack the power of a real to-do list like Wunderlist or Todoist. With /todo (a Slack reminders add-on), you can add assignments, due dates, and a task dashboard to Slack. You can assign tasks to any Slack user in your team, and see the task reports (completed, open, assigned) in the /todo dashboard. It’s a lot like the native /remind feature, but it’s got a few extra advanced features that turns it into a very powerful tool. And, it’s free. It’s possible to turn Slackbot into a fully-fledged knowledge base with custom responses, but it’s not the absolute best way. You can enhance the capabilities with an add-on like Tettra or Niles. Instead of having to remember to program Slackbot with new information each time it comes up, you can just @mention Niles and either get an answer or teach the bot something new. If it looks like Tettra’s pulled up the right resource, you can click to share it with the channel, keeping everyone on the same page. 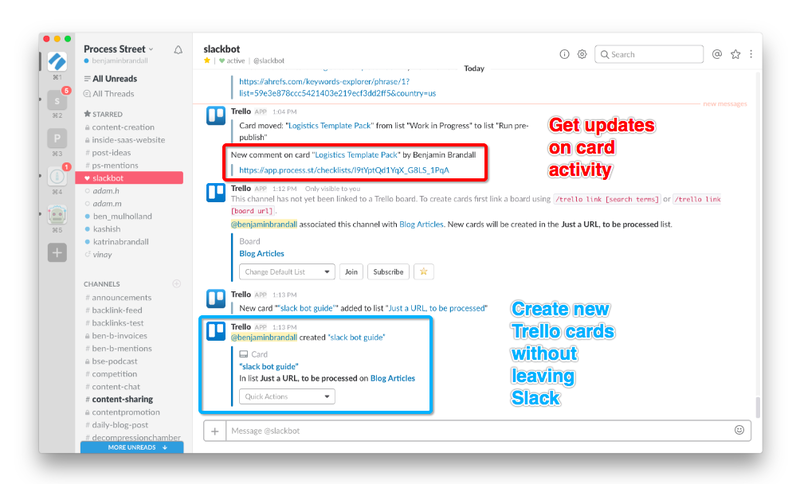 You can get Slack notifications in the form of an email digest, or in app, but with Trello for Slack you can also push them to Slack so you don’t have to manually check up on your team’s activity. In the screenshot above, you can see that I’ve linked the Trello app for Slack to Slackbot so I can get notified on blog post activity as well as add new post ideas to the Trello board just by typing a command. /trello add "slack bot guide"
And the bot will create a card for me in the first list of our blog articles board. Here’s another reason to never venture outside the realms of Slack: you can use it for calendar notifications. Connecting your calendar is easily done — you just need to add the Google Calendar app to Slack. Select which calendar sends notifications to which channel, and you’re away. Check out Slack’s help doc on the topic for more information. There are a couple of methods you can use to integrate Slack with email, but by far the simplest is Slack’s own email app. When you add it to Slack, you get a secret email address. Use that email address to sign up for newsletters, cc it in important support conversations, or forward emails there. This a great way to quickly share information that might otherwise get swept away in Gmail‘s relentless stream, and works best when you want to share emails with a group of people (like the #support channel for urgent customer issues or the #marketing channel for excellent email copy!). As a remote team, we recently started using Donut at Process Street to bring everyone closer together. 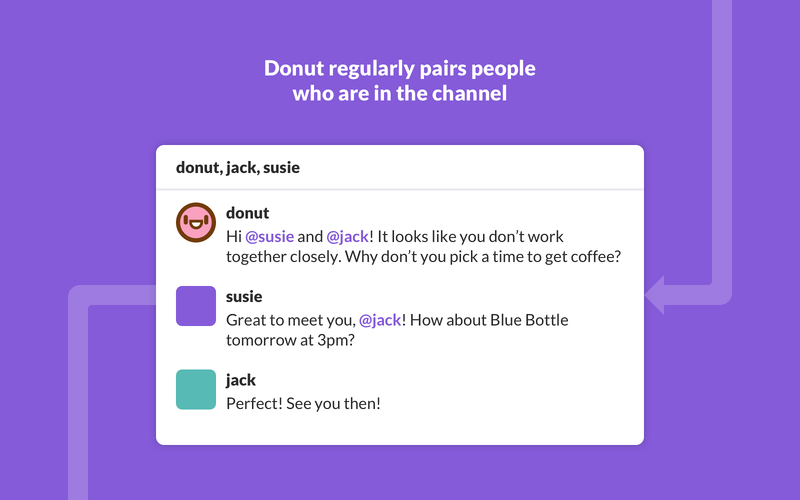 Donut works by randomly matching 2 or more team members together each week, and letting them set up a quick 10-minute call together where they can talk about their hobbies, personal life, or anything they choose. At this point, I’ve met 5 or 6 new people that I wouldn’t otherwise get a chance at work to speak to! At just the cost of 10 minutes of everyone’s time each week, you can improve the strength of your team and your company culture. A major criticism of Slack since the very beginning is that it’s easy to lose important material in a rapid-fire chat interface, even with a powerful search. You can do a lot to get around this, such as by pinning or starring messages, but this can quickly turn into just another thing to manage. What if there were a way to have a company-wide list of resources that made everyone accountable to read it? @must-read is exactly that! It’s simple, but it could be exactly what your team needs. I installed it just to get a few screenshots, but we’re already making good use of it. Should we build that new feature? Did anybody watch the new Game of Thrones? Anyone want me to go get a coffee? Poll your team in Slack with Polly. This poll bot includes anonymous or public voting, recurring polls, surveys, team happiness tracking and an analytics dashboard. Polls can be a fun way to get your team interacting, but also can be used for a variety of practical reasons. You could schedule a recurring poll to track meeting attendance, or agile teams could use polls to anonymously assign story points . GrowthBot can tell you a lot of valuable metrics for completely free, but it’s not a power tool for big data. It can’t run huge exports or generate reports, but it can give you a quick answer that might serve as a great starting point. 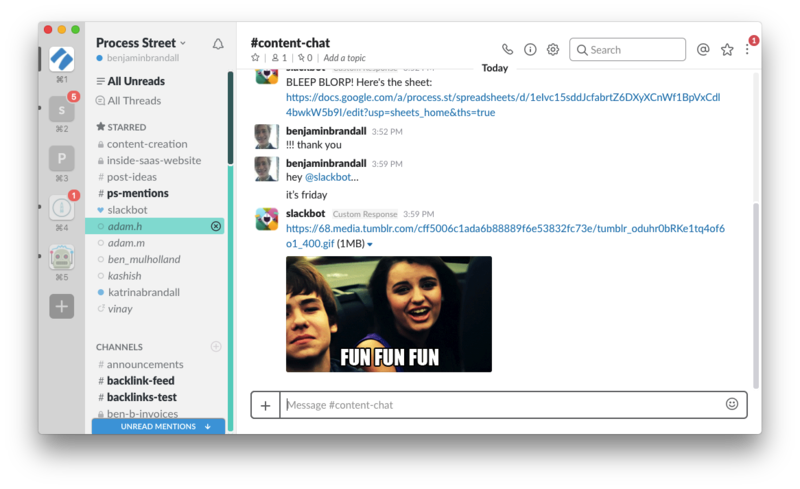 Conclude adds two new slash commands to your Slack: /propose and /conclude. The propose command is where you enter your proposal details, and then the bot will create a temporary channel for focused discussion on the proposition. When the team has reached a decision, use the conclude command to disband the channel. It’s a simple tool, but one that helps decision-makers stay focused on resolving issues as quickly as efficiently as possible. If you want to add leads to your CRM, add meeting notes, get notified about upcoming sales calls, and more, then try sudo. I feel like the best way to sum up the use most people would get out of sudo is that it saves you switching into your CRM for little annoying tasks. 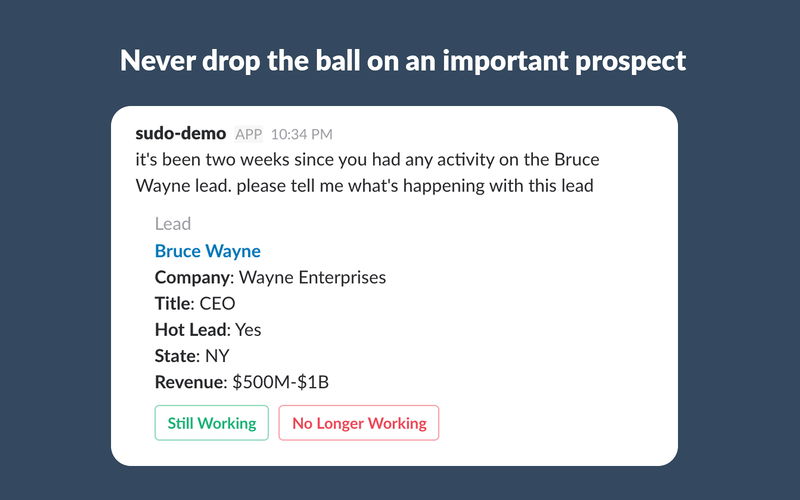 While you’re likely to spend a lot of time in Slack, it’s not always practical to use your CRM’s more powerful interface for tiny things like updating leads and adding notes. Just ask sudo to do it instead. Complaining about tax returns is a staple of ’90s comedy for a reason: everyone hates it. Thanks to Taxbot, you can get the job done without leaving Slack. Taxbot uses a chat bot to find out more about what exactly you need from a bookkeeper, then gives you a quote from a professional that you can accept or reject inside Slack. 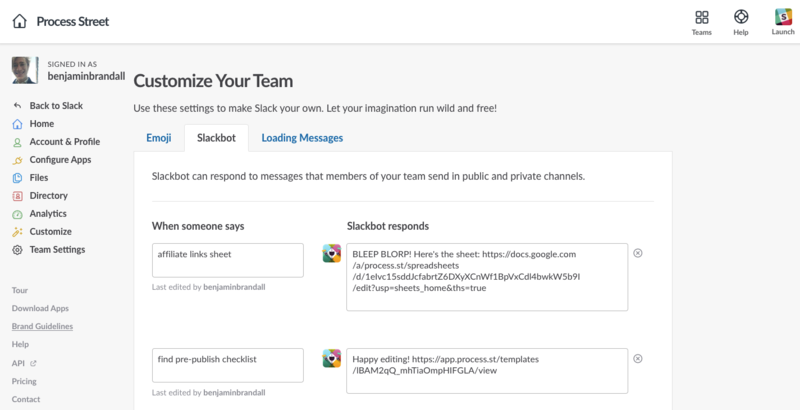 Anyone with a little bit of time and the right guide can knock together a Slack bot, so if you can’t find one that does exactly what you want to do, then you can either make it from scratch or integrate Slack with another app or trigger by using Zapier. 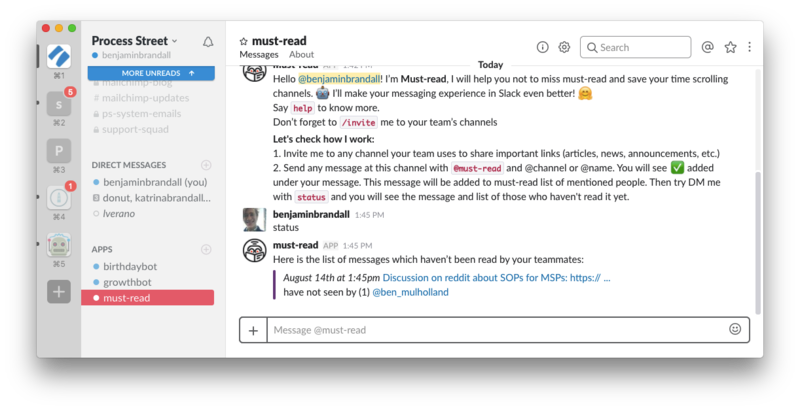 Did you know Slack can also be an RSS reader? You can create your own Slack bot with Zapier for free, and set it up to post in a specific channel (like #tech-news) every time a new item enters the RSS feed. I hope this post has taught you about how you can power up Slack and get more done! 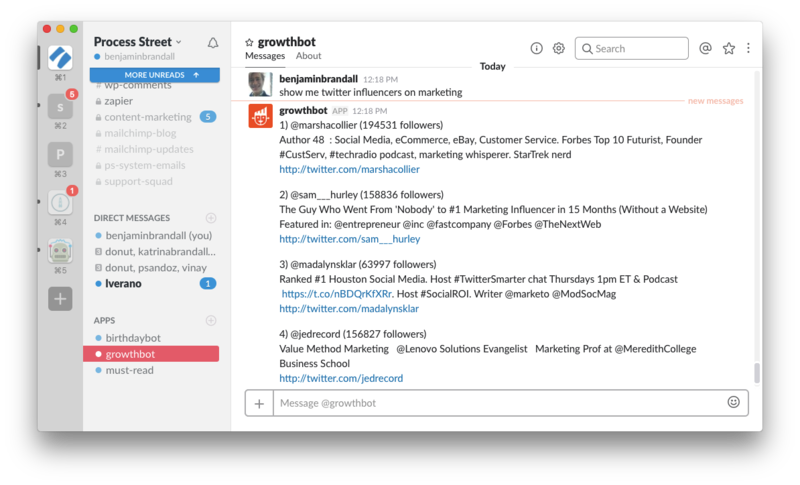 If you’ve got a Slack bot you think should be on this list, let me know in the comments! You are officially my favorite blog. Thanks for the awesome article!